If you're a worship leader struggling with overhead slides, messy worship songbook binders, coordinating music with your worship team, and worship song licensing issues, then you'll be amazed at the low-cost solutions that going paperless provides. OnSong is an iPad app that was designed specifically with worship leaders in mind. OnSong integrates seamlessly with Rockin' With The Cross, an online subscription service that provides access to thousands of worship songs for just pennies a day. Once you enter your subscription details within OnSong, you can instantly download anything from the RWTC catalog instantly and in complete compliance with all licensing issues. Once you have your content loaded, OnSong works as a lyric/chord chart reading app that has a comprehensive set of features. Features ranging from the ability to share setlists wirelessly with your team mates to being able to project the lyrics in a presentation format for the congregation while simultaneously reading the musicians' view of the music. No more synching issues with the PowerPoint operator asleep in the back of the sanctuary! To top it off, OnSong works with the AirTurn line of Bluetooth pedals for hands-free control of your music. With the 2-pedal AirTurn DUO or AirTurn PED, you can set up basic forwards and backwards page turns within OnSong. 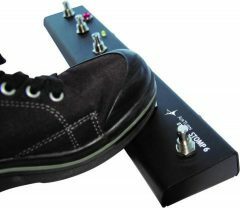 But with the AirTurn QUAD or STOMP 6, you can customize the function of each pedal to do far more, from transposing music on the fly, to triggering backing tracks and setting tap tempos, all hands-free.